With the MA degree in PR with New Media, solving communications & design problems from a Public Relations Perspective is what Andrew Brett trains entrepreneurs to do on programmes such as UCC’s Ignite and UCD’s Innovation Academy, as well as Bank of Ireland’s Workbench for business start-ups. This approach is at the core of Andrew’s own communications and graphic design practice at Via Brett, which helps businesses to identify, articulate and communicate the values and purpose of their brand, in a way that is appropriate and relevant to resonate with the key stakeholders. 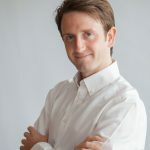 Andrew typically works best with businesses that realise the importance of connecting with the person, having successfully helped to deliver design solutions for initiatives with Pieta House and currently works to help businesses on the Social Entrepreneurs Ireland programme, as a consultant and designer.